I very much enjoy the traditions of the Black Madonna and Blessing of the Fleet and wonder why they are not better promoted by the City of Fremantle, to attract more people. Most people just happened to be there and only a few had come to watch because they knew about it. Footnote: I don’t mean this disrespectful in any way, but why are people in processions always looking so morose? You believe in your God, and going to heaven after this already beautiful life, so why don’t you smile and delight in your faith? 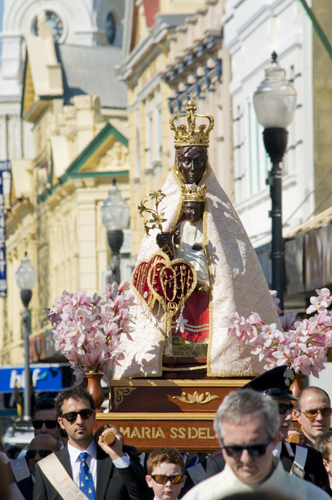 The traditional Black Madonna procession through Fremantle is on this Sunday. It starts at 2 pm from the Basilica at Queen Adelaide Street and winds through the inner city, from High Street, Mouat Street, Esplanade, Cappuccino Strip. There is also daytime fireworks around 2.45 so the kids don’t even have to stay up late for it. 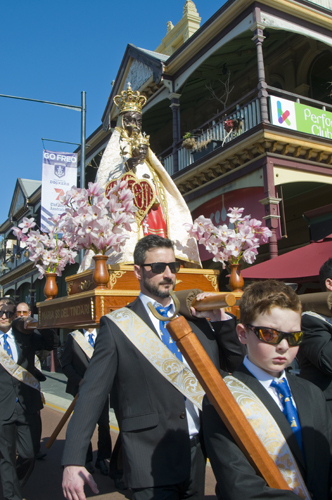 The Maria Santissima del Tindari statue will be carried on the shoulders of volunteers, so come and enjoy the lovely spectacle that is so very Freo and much more than just a religious tradition. I am getting a bit repetitive at my old age telling you yet again how much I love so-called street photography. Finding the unexpected and capturing it on camera is one of the many delightful parts of my profession. The fact that I am also recording the history of Fremantle with every photo I take here makes it a responsible activity as well. I took this photo at the Adelaide Plaza next to the Basilica late this morning. BLESSING OF THE FLEET TODAY! Come and join the special yearly Blessing of the Fleet today. It has become a community procession for all and is a great event that I never miss. It starts at the St Patrick’s Basilica at 2 pm and ill wind through the cbd and west end to the fishing boat harbour. It should not be long before you’ll hear the first firing of the cannon. The procession will stop at St John’s church where that priest will join the parade. Let’s hope the rain will stay away till after the Blessing. The Truck Stop Fremantle Festival event yesterday attracted many people. I had to work in Perth so could not be there but driving past at 3pm on my way home the inner city was alive with many hundreds of people and looked very revitalised. Truck Stops are now the new black with a food truck market at Garden City on Fridays and one in the Perth Cultural Centre on Fridays and Saturdays. Comments Off on BLESSING OF THE FLEET TODAY! 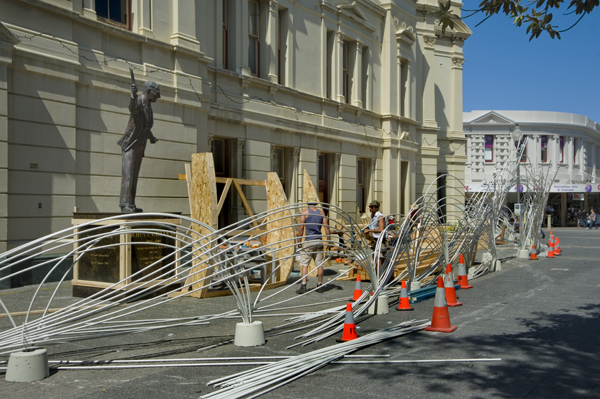 The annual FREMANTLE FESTIVAL starts this weekend with the Blessing of the Fleet on Sunday. The procession will leave the St Patrick’s Basilica at 2 pm so come and join this great community event. At the Townhall the construction of a pop up bar is under way and it looks as if John Curtin is not very happy with it, but that is probably only because the bronze sculpture is not great art. The festival has all the traditional goodies with one significant change of the Wardarnji Aboriginal Festival moved to an evening event instead of daytime. I love Freo’s festivals. They are always good fun, but I would love to see some creative changes to the Fremantle Festival as it has become very much a carbon copy of previous years, year in year out, and that is too predictable to still be exciting. 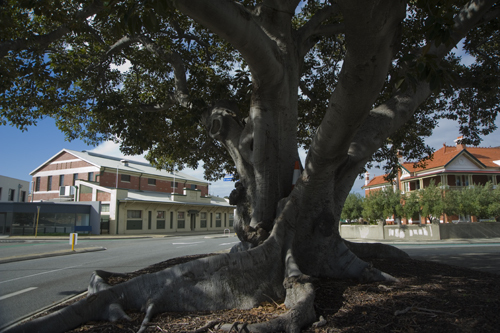 Developers MATCH are proposing a micro brewery for the mix-use development of the former Fremantle Energy Museum building at 12 Parry Street which has as neighbours across the road the Basilica and Clancy’s and is only a stone’s throw from the HEIRLOOM BY MATCH residential development of the former Dalgety Woolstore at Queen Victoria Street. The proposal for a five-floor 4o residential apartments development and street level micro brewery would greatly assist the activation of the East of the CBD, where other new development is already under way or short before commencing. The former Boys School as Princess May Park should also find new operators soon and I noticed development activity next to the Australia Hotel at Beach Road as well on Friday, so there is a lot going on in the east end of Freo. The traditional Maria Tindari- Black Madonna procession happens every year in Fremantle about a month before the Blessing of the Fleet, and the 3 pm daylight fireworks always come as a big surprise to the Sunday crowd, as it did again on Sunday. The procession starts at the Basilica in Adelaide Street and wanders through the West of the city and Cappuccino Strip. The Blessing of the Fleet is on again the last Sunday in October. Here some photos of today’s BLESSING OF THE FLEET in Fremantle and from the again disappointing Seafood Festival in the Fishing Boat Harbour. The latter is not substantial enough to be called a festival, and the organisors should drastically improve it next year it or cancel it. The Blessing of course is always worth going to town for as it is such a lovely tradition that is deeply rooted in the Italian culture. I love it.